So here we are, the 1960s. It’s taken a while to get here. We went through the early Disney animated films, through the packaged films during World War II, to the adventures, westerns, and nature documentaries. So what’s next for us in this new decade. Well, it seems like the family comedy, and there is a great representation of that in the first film of the decade from Disney, Toby Tyler (or Ten Weeks with a Circus). It’s pretty well documented that Walt Disney favored his childhood home of Marceline, Missouri and the early 1900s. Even Disneyland and Magic Kingdom’s Main Street U.S.A. is supposed to reflect that turn of the century small town America feel. If you are unfamiliar with the time period, one of the biggest attractions in the world was the circus and when it came to town, it was like seeing the show of shows. So Walt Disney read James Otis Kaler’s Toby Turner story, possibly during his childhood, and he decided it would be a wonderful piece to turn into a film. The studio had several actors under contract at the time, many of whom were regulars on television, so it wasn’t a difficult choice to cast some of these actors in his film. Kevin Corcoran, better known as Mickey Mouse Club’s Moochie, who had also starred in previous films The Shaggy Dog and Old Yeller, was cast as the title character in the film. Gene Sheldon and Henry Calvin from Zorro were cast in supporting roles, as well as Zorro’s Charles Barton as director. The story revolves around an orphaned boy, raised by his aunt and uncle, who runs away and joins the circus. He takes over as a horse rider in one of the acts when another rider becomes injured. He befriends several circus performers including a chimpanzee named Mr. Stubs. When he hears that his uncle is sick, he and Mr. Stubs run off, but return to the circus so that his aunt and uncle can see him perform. If the movie sounds simple or silly, that’s because it was meant to be. This is a comedy film with little substance, but filled with practical stunts and slapstick comedy. The movie was released on January 21st, 1960 with critical acclaim from critics. The movies praise came in it’s simplicity, it’s hysterics, and the family fun adventure. The film, when opened to the public, got little response. The film was never released again in theaters, but like other poor box office draws, was broken up into segments and shown on television so that it could make money through advertising instead. If the film is any indication of what’s to come, I’m ready to enjoy a few laughs. The simple comedy is a much enjoyed departure from the True Life Adventures and the ridiculous over-the-top westerns starring Fess Parker. As simple as they are though, I do hope we see some live action films with a little substance. Toby Tyler was a fun movie, but forgettable in the long run. More than any animated film, or more than any Western film starring Fess Parker, I can sum up the 1950s as the decade that Disney experimented with documentaries. The True Life Adventure series had been Disney’s “little project that could”. The crew for True Life Adventures was small and had continued to be the same for the majority of it’s run. It made the leap at the beginning of the decade from short subject film making to full length feature film. Many of the films were praised for their content by critics. So now, at the end of the decade, it’s fitting to wrap up the True Life Adventure series with one last film before we head into the 1960s. It’s wide release came in August of 1960, but it’s official release is December 16th, 1959 as it was played in a few theaters so it would be eligible for awards season. At it’s release, the film was praised by critics and this film was generally liked by audiences as well. Despite troubles with it’s production (Amazon weather destroyed some film before it made it back to the studio.) Disney and the True Life Adventure crew had very little trouble putting this film together and making sure it would be a hit with audiences. So why is this the last film in the True Life Adventure series? If they were making money on low budget documentaries, wouldn’t they want to continue making them? That’s a big mystery. There are several possible answers to this. The most popular answer is that Walt himself didn’t see the need to continue these films in theaters, but instead use the footage for television as he was working to stay on tv. He felt the nature documentary was suited for 30 minute or one hour episodes of television. He was right as Disney did continue to be successful with showing nature on television. Beyond Disney, nature has become a big subject for television, especially during the expansion into cable in the 1980s when we started to see channels like Discovery completely embrace the nature documentary. That’s practically all they show. That has also expanded into travel channels, and even National Geographic bringing it’s popular magazine to the small screen. The other probable answer to why the True Life Adventure films died with Jungle Cat despite it’s success has to do with the previous film in the series, White Wilderness. If you recall from my previous article on the subject, White Wilderness was later found to include “phony” images. Polar bears were shot in a studio instead in real snow, and lemmings were forced into killing themselves to sell the audience on rumors of lemmings following each other, even to death. The controversy of the film didn’t make it to the public until decades later, and Walt may not have even known about the film’s use of fake material, but if he did I would suspect that Jungle Cat was our last film as he wanted know part of cinematography that was portrayed as real but wasn’t. He had no intention of fooling the audience, and he especially didn’t want his subjects on film being killed just to make money. Whatever way you want to spin it, the fact is the True Life Adventure series was the birth of the nature documentary and it’s legacy lives on in film and television. Disney did eventually go back to the nature documentary as something they would like to put in theaters when they created the permanent division of Disney titled Disney Nature. Those films will eventually be covered, but we still have decades of material to go before getting there. In the meantime, we will have to look to the 1960s as the death of the nature documentary and the beginning of something new. What that is, I guess we will see as we venture into the oncoming films of the decade! The 1950s had been an interesting time for Walt Disney. He had grown to enjoy the process of live action film making. He built his idealistic park for families. He had regrown his studio from a place made out of bank loans, to a profitable studio that was churning out multiple films a year. With so much on his plate and with such success, he deserved a vacation or two and there was no better vacation spot for him than Europe. He took his family multiple times and found inspiration for the studio, because he was never off the clock, and got excited about projects to come. One such instance was after a several skiing trips in Switzerland. He got excited about the location and making a picture in or near the Swiss Alps. That movie became Third Man on the Mountain. Shooting started in the summer of 1958 under the name “Banner in the Sky”. The title came from a book of the same name written by James Ramsey Ullman. Walt thought the story of a man who had died upon a mountain and his son who wanted to climb that same mountain in the name of his father was a great story. It’s a heroes journey and a man versus nature story. The film was shot over the course of 3 months, between the Switzerland location and a studio in London. James McArthur, who had played the lead in The Light in the Forest, played the hero Rudi in the film. Janet Munro, who had been in Darby O’Gill, came aboard to play the love interest of Rudi, and Michael Rennie, who had been a big star in The Day The Earth Stood Still, played Rudi’s boss and mentor. A great cast, an amazing backdrop, and a very good story won over film critics. Walt Disney was proud of the film, but when the film was released on November 10th, 1959, people didn’t want to see the film. It could be that the film didn’t do well as Disney’s name had been on so many movies in the past few years and the world had tired of the Disney name. It could be that the story is suited for a niche audience. Third Man on the Mountain is basically an action story with a love story shoved in. That being said, we could be missing out on a female audience for the film or even the family audience Disney had been known for. The film was expensive to shoot due to the travel the cast had to go through to get to different areas of Europe. To make money out of the film, Walt decided to show the film in parts on his Disneyland TV show under the novel’s Banner in the Sky name. The film was never released in theaters again and has seen minimal home video release, the last release being in 2004. It’s a shame as this film is much better than many of the western films made off the back of Davey Crockett. The shining light at the end of the tunnel came in strange fashion. The film, which did poorly, gave us one of Disney’s new Disneyland ideas in the late 1950s. Filming took place on a mountain titled Matterhorn mountain, and when developing new attractions for the park, Walt thought building a roller coaster inside of the Swiss mountain would work for the park, especially since there was such a large mound of dirt from them digging up areas of the park. The Matterhorn is now a Disneyland classic and constantly has a long line at the park. If anything, Third Man on the Mountain gave us Disneyland’s first roller coaster and an attraction never replicated anywhere else in the world. In the late 1940s, Walt Disney made a trip over to Ireland. Looking for inspiration, similar to his South America trips, he made a visit to the Irish Folklore Commission. He was excited to find a story for a new feature. Unfortunately his Irish inspired film got shelved when he decided to focus on feature animations again. Then there was another sidetrack, Disneyland, but by the late 1950’s Walt went back to thinking about his Irish film. He settled on a set of stories from the early 20th century by Hermione Templeton Kavanagh, an Irish-American writer, and called the film Darby O’Gill and the Little People. Walt’s Irish tale had some of his best men working on the film. Lawrence Watkin, who had written Treasure Island and The Light in the Forest, as well as Robert Stevenson, who directed Old Yeller and Johnny Tremain, were put to work on the project. Albert Sharpe, who had played Andrew Campbell in Brigadoon a few years prior, was cast as Darby and Walt took a chance on a newcomer named Sean Connery. Walt was committed to telling a unique folklore story and wanted to keep the magic of the stories. Therefore he wanted to add a note to the beginning of the film thanking the Leprechauns for participating in the film. He also opted not to credit actor Jimmy O’Dea for his role as the King of the Leprechauns. For Walt, that kept filmgoers thinking that the Disney film was truly filmed with little people and the Disney company had gone out of there way to find them. Despite advertising on the Disneyland television show, and Walt’s magical “discovery of real leprechauns” the film didn’t hit home with audiences. Released on June 26th, 1959, the film didn’t do well and lost money in it’s first run at the box office. Many American movie goers said the Irish actors were too difficult to understand and the live action film wasn’t as “Disney” as other films had been previously. In the re-release of the film in 1964 the actors were dubbed over by American actors but the film still didn’t do so well. Critics, on the other hand, loved the film. They praised the special effects and acting as well as the representation of Irish culture, which was often not seen in films. This was still the time of the Westerns in American film. The film never won any awards but in later years it has become a cult favorite especially around St. Patrick’s Day. The film’s most notable claim to fame is being the launching pad for Sean Connery. Albert Broccoli took notice of the actor and would cast him in the first James Bond movie. I can’t imagine James Bond without Sean Connery and I know that as we go on through time, Walt Disney will be the launching pad for other young actors as well! What are your thoughts on Darby O’Gill? Have you seen it? Is it something you’d be interested in seeing? Leave your comments below to keep the conversation going! When I wrote about Tonka, I said it was the end of an era at the Disney studio. Westerns had dominated the live action films of the 1950s for Disney, but as we were about to head into a new decade, a new type of live action film would become the norm at Disney. I’ll call it “gimmick comedy”. 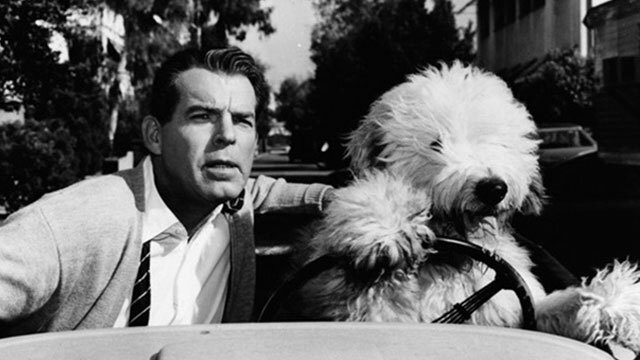 The first of these gimmick comedies was The Shaggy Dog. Walt Disney had become a house hold thanks to television. Thanks to the Disneyland tv show and the Mickey Mouse Club, his success in television was profitable. As he looked to expand into more television, he came across the story “Der Hund von Florenz” by Felix Salten. Salten had already been a name at the studio as they had used one of his other stories, Bambi. “Der Hund von Florenz” or “The Hound of Florence” is about a young boy who wishes to be a dog. Walt found that the adventures the boy could go on as he transformed into a dog would make for a good television series. A pilot for the new Shaggy Dog series was put into production. 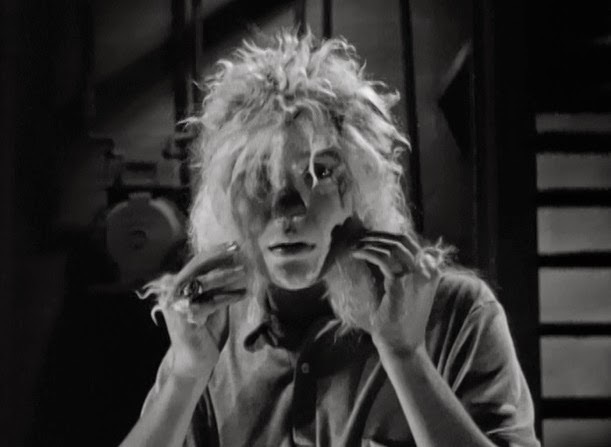 Charles Barton, who had directed Spin and Marty episodes of Disneyland, was made the director and many of the children from Mickey Mouse Club, Spin and Marty, and the Hardy Boys were cast into roles. Tommy Kirk, who had also been in Old Yeller, was cast as the transforming boy, Wilby, and Kevin “Moochie” Corcoran of Mickey Mouse Club fame was cast as the little brother. Television regulars Fred McMurray and Jean Hagen filled out the rest of the cast as the boys’ parents. This was the first Disney film to be shot completely in black and white. Walt had prided himself on new technologies and breaking barriers in the film industry. Since Snow White, he had made his films in color, but the Shaggy Dog was met with a few faults. In color, the transformation of Wilby from a boy to a dog looked fake. Shooting in black and white hid some of the visual effects. The film, since it was never meant for theaters, was also shot simply instead of using something like Cinemascope or Technirama 70. The tv pilot, which was shot at the low budget of $1 million (Sleeping Beauty cost $6 million.) was then decided that it might fit the big screen. The mini-series was pushed together into one larger film and was advertised as a new type of film from Disney. The movie was released in March of 1959 and unlike Sleeping Beauty which made it’s theatrical debut two months earlier, became a rousing success. Critics and audiences alike loved the films comedy and style as it resembled a television sitcom but with better production values. The film grossed $9 million in it’s initial run and ushered in the new era of gimmick comedies. Walt was happy with his new film and pushed the studio more toward this style which dominates the 1960s and downplayed animation, which we will see much less of in the coming decade. 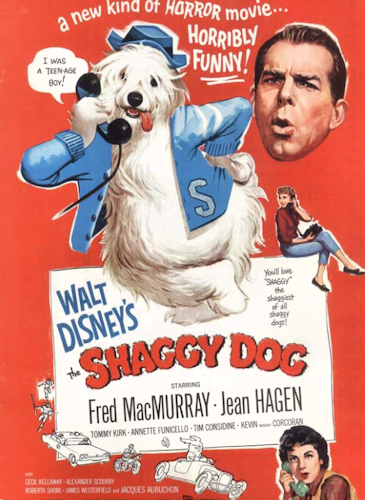 The Shaggy Dog, despite it’s somewhat cheesy premise, went on to become a classic for the Disney company. The film from 1959 still holds up and still holds credibility for younger audiences who aren’t familiar with the vast amount of Disney live action films. The Shaggy Dog would also inspire a sequel, a made for television remake, and a theatrical remake. It would also be an inspiration for other “talking dog” films in the future like Homeward Bound or even the Air Bud series of films. If Davy Crockett defined the 1950s at the Disney studio, you can bet that the Shaggy Dog would build towards defining the 1960s. There will be greater comedy films to talk about in the coming decade but The Shaggy Dog broke open the door for all of those films to be made. What are your thoughts on The Shaggy Dog? Have you seen it? Do you like it? Do you hate it? Leave a comment and keep the conversation going! Arguably one of Walt Disney’s greatest animated films, Sleeping Beauty is rich with a history all it’s own and when trying to sit down and write this, became a bit of a problem as I wanted to do the film justice while keeping the history from bouncing around too much. Sleeping Beauty’s debut in 1959 marked the largest gap between Disney animated features as the last film, Lady and the Tramp, was released in 1955. It had been 4 years so what took so long? The truth of what took so long actually reaches farther back than Lady and the Tramp’s release. Sleeping Beauty actually was in production before other features as well. The story of “La Belle au Bois Dormant” or “The Sleeping Beauty”, written by French author Charles Perrault, was discussed and as early as January 1950 and the story started to take shape in 1951. After the success of Cinderella, Walt wanted to move forward with the princess film but the Perrault version of the story, he felt, resembled the other princess films that he did (Snow White and Cinderella). The story was reworked with more elements from the Brothers Grimm telling of the story, better known as “Briar Rose”. The story was finalized in 1952 and animation began on the film in 1953. With so much going on by this point at the Disney studio, including television, live action films, and the upcoming Disneyland, Walt handed off the film production to Ken Anderson and Eyvind Earle. Anderson was in charge of the overall production and look of the film, but Eyvind Earle, who had only be at the studio since 1951, was put in charge of the style, color palette, backgrounds, and character designs. With Walt gone and Ken Anderson also working on the development of Disneyland, Earle was given more freedom than any artist on any other production up until that point. Due to Earle being a perfectionist and his lack of work at the Disney studio, he rubbed many of his peers the wrong way. Regardless, he carried out great influence on the film, which Walt wanted to be a moving piece of art. Earle turned to the stories roots and decided to focus on an art style that would evoke a Medieval Europe. The color scheme was not as bright and bold, and the characters were given more sharp edges. Earle, being the perfectionist he was, painted every single background himself, taking up to a week to complete a single painting, as compared to other productions where it took a single day. We can’t blame Eyvind Earle for anything here, as Walt was looking for the perfect film, and since Cinderella was such a success, Walt could afford to dump money into Sleeping Beauty. Walt opted to make the film inthe more expensive Super Technirama 70, a film type that used a 70 mm frame instead of the standard 35 mm most film reels took. Walt decided on the film style so he could have more details in the animations and backgrounds. Walt also decided to use Xerox for the first time in a film, allowing animations of the dragon to be bigger or smaller depending on the need in the frame. Earle’s insistance on different character designs went against many of his peers and as a result, the animators at the studio had to rework their style to adapt to what Earle saw fit. Lead animator Marc Davis was put in charge of Aurora’s design, based on Audrey Hepburn, as well as the villain, Maleficent, whom Davis wanted to look less like a witch and more like a vampire. We can credit Davis for Maleficent’s signature look, with her horns and “flaming” robe. Ollie Johnston and Frank Thomas were put in charge of the fairies. The Perrault story originally has 7 fairies, but it was decided in writing the story that there would only be 3. Walt wanted all of the fairies to look the same, but Johnston and Thomas found that boring and not fitting of the story. Since there would be so much time spent with the fairies versus our princess, the veteran animators wanted to give them personalities, each with a different look and color scheme. Despite, Earle’s direction and need for others to adapt, for myself personally, the characters by Davis, Johnston, and Thomas are what make Sleeping Beauty a Disney classic. Like many of the animated films of the time, live action references were used for animators, and at Walt’s recommendation, Johnston and Thomas observed old women at the market to get the right movements for their 3 fairies. The reliance on this classic Disney way of animation as well as the introduction of Medieval artwork and new technologies allowed the film to feel fresh but familiar. By the end of production, it took over 1 million drawings and a $6 million budget to complete Sleeping Beauty. Walt also wanted the film to have a catchy soundtrack to be able to sell on vinyl, but after hearing Pytor Tchaikovsky’s ballet of “The Sleeping Beauty” Walt opted to adapt the orchestration of the ballet to the film. This was unique as only 1 true song, “Once Upon a Dream” was added to the film. Most Disney features (excluding the package films) had been packed with songs. Rewriting of the story, changing in animation style, introduction of new technologies, and Walt’s changing heart toward the musical style of the film all pushed Sleeping Beauty back and that’s why the film took 8 years to make. Even though the length of production went longer than any other production in the history of the Disney studio, Walt had a positive feeling about the film. 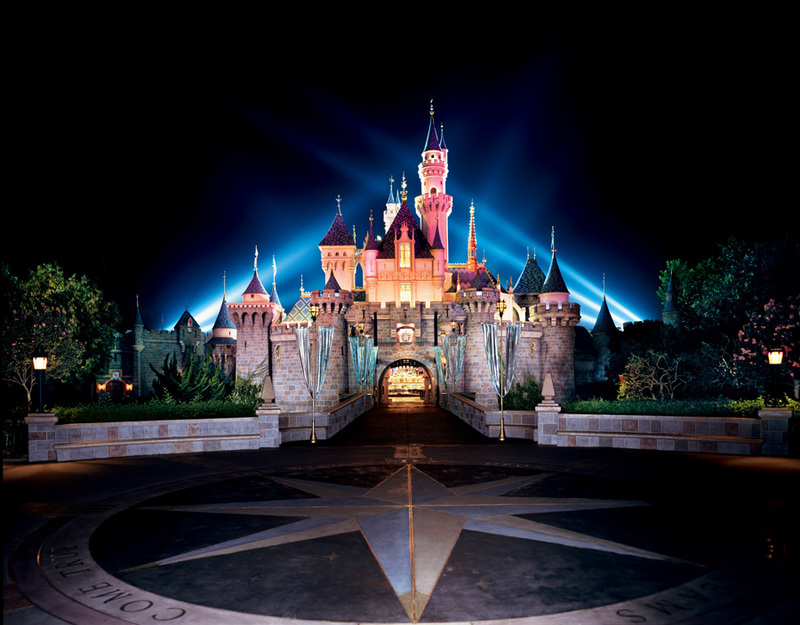 He decided to give it focus on his Disneyland television show, give it a decent budget for advertising, and before Disneyland opened in 1955, changed the name of Snow White Castle to Sleeping Beauty Castle, making it the key figure of the park 4 years before the film even made it’s debut. The castle was filled with dioramas, showcasing the new style of his animation department and building a buzz around the film with it’s own attraction in his park. 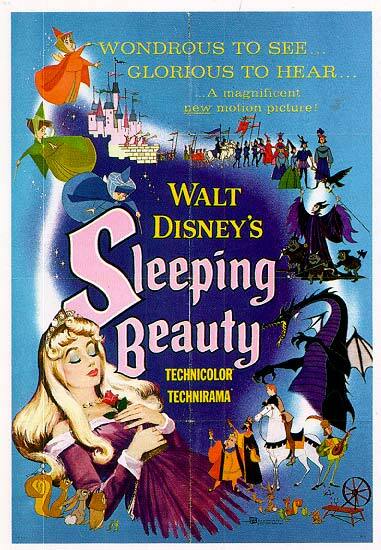 Sleeping Beauty was finally released in January 1959 and regardless of Walt’s advertising campaign for his $6 million movie, the largest budget for a Disney film to that date, the film didn’t make back it’s budget in it’s initial release. The film received mixed reviews during the time, noting that the film didn’t focus on our heroine, Aurora, or that the design wasn’t what movie goers had come to expect of a Disney film. The film lost $700,000 in that first run and because of it, left Walt sour on his animation department. With success in live action films, television, and his theme park, it seemed logical to drop the one failing department at his studio. Luckily for us he didn’t drop animation from the studio, but animated features would get less attention and lower budgets for the next few decades after Sleeping Beauty. After the film’s initial release, there were 4 re-releases of Sleeping Beauty with the last in 1995. All 5 releases bring the film’s total box office to just over $51 million. The legacy of Sleeping Beauty actually make this film much bigger than in Walt’s lifetime. We now regard Maleficent as one of Disney’s best villains and the character got her own live action retelling of the story in 2014. 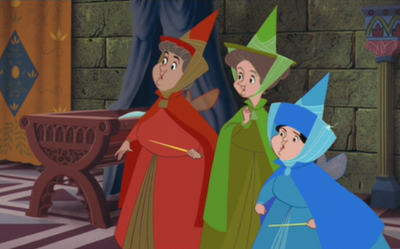 The 3 fairies are regular characters in Disney Channel show “Sofia the First”. The Hong Kong and French versions of Disneyland also have a castle named after the film. I would go out on a limb to say that Sleeping Beauty, along with Davy Crockett and Cinderella, are Walt’s most credible creations of the 1950s. Sleeping Beauty will continue to be reimagined by Disney and be enjoyed by audiences around the world. What do you think of Sleeping Beauty? Do you love it or hate it? Leave a comment below and keep the conversation going! As the 1950’s come to a close (Only a few more left until the 1960s!) it’s fun to look back and see what the decade was really alabout. The 1940s had given us were purely centered around animation at the Disney studio, but when Walt Disney found that he could make films faster and make money quicker, he opted to only give us 4 animated films in the 1950s as opposed to 24 live action and documentary films. As closely attached as animation is to Disney, we can’t forget his live action films either. 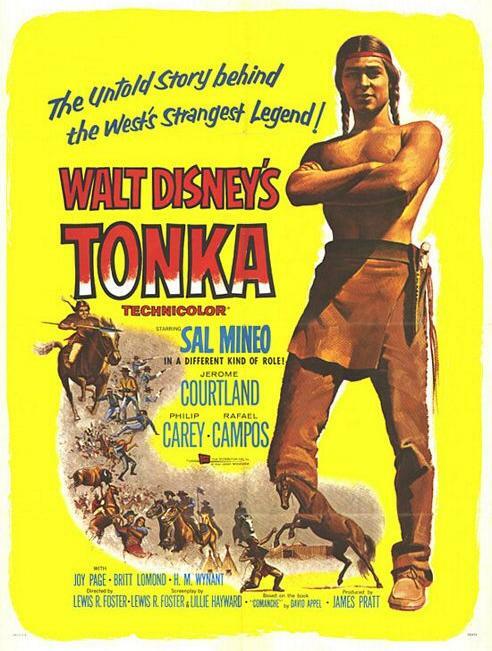 The 1950’s also brought us plenty of Western films from the Disney studio. Westerns have often been romanticized as cowboys being heroes. Cowboys have often been “the good guys”, but through the prism of history we can settle on the idea that cowboys of the “wild west” often claimed land that wasn’t theirs, similar to those who landed at Plymouth, and they killed those Native Americans that stood in their way. Walt Disney was one of the few Hollywood business men to portray a more realistic look at what times were really like during the 1800s. We discussed The Light in the Forest already and how a boy raised by Native Americans was taken back by the European Americans and eventually decides to no longer be part of the battle. This week we discuss a film that came out in the same year, Tonka. Tonka is based on a book by David Appel titled “Comanche: Story of America’s Most Heroic Horse”. The film takes a look at how a young Native American boy named White Bull takes in and trains a horse. He names the horse Tonka. When the horse is mistreated by others, White Bull sets him free to run wild but the horse ends up being owned by a U.S. army captain named Miles Keogh and renamed Comanche. As the story unfolds, we find ourselves on the brink of war between the U.S. army and the Native Americans. Despite the rivalry, White Bull seeks out his horse in camp and befriends Miles as they share their common animal friend. Regardless of this friendship, the Battle of Bull Horn erupts and White Bull and his horse remain as the only ones left standing. The film showcases fictional history and depicts the unnecessary rivalry between the European Americans and Native Americans. It’s an interesting film and one that has unfortunately been forgotten over the years. It was a success with critics and at the box office when it was released in December 1958. Maybe we would rather remember films from John Wayne or Clint Eastwood where cowboys are heroes, but I think I prefer this depiction. I like to remember history as having no true good guy or bad guy, but rather a story where everyone made mistakes and unfortunately we paid for it regardless of what side you were on. There have been rare occurences of the Disney company being surrounded by controversy. It eventually happened with Song of the South. That film will never be remastered and released due to it’s controversial look at race relations. The next great example of that came with our next movie decades after it’s release, White Wilderness. The True Life Adventure series, like the Fess Parker films, defined the 1950s and like the films all starring Fess Parker, True Life Adventures would be gone by the 1960s. Not that the series was bad or expensive, but more or less because of what Disney knew about their 1958 release of White Wilderness. Starting in 1952, 12 videographers made their way to the Arctic and filmed. Due to the extreme climate of the Arctic, these film makers would travel back and forth so that they didn’t have to live in such harsh conditions for too long. Like all of the previous True Life Adventure documentaries, Disney funded but did not overlook the filming that happened in the Arctic. This lead to uninterrupted footage of many great and not so great shots that would eventually be in the film. After cutting and editing, the film was released on August 12th, 1958. The film met similar reviews to their previous nature documentaries. They were criticized for the narration and unnecessary comedy, but because of the Arctic’s rough climate, it was the first time anyone had seen the landscape on film and in color no less. The animals documented in the film include seals, walruses, polar bears, ducks, lemmings, and wolves, all of which had not been seen on this terrain by the mass public. Despite critical reviews, White Wilderness was still a box office success. It was released multiple times in theaters after it’s original release due to it’s popularity. Clips of the film were shown on Walt Disney’s television shows up until the 1980s when the film came under fire. The Canadian Broadcasting Company (CBC), and one of it’s longest running news shows, The Fifth Estate, ran a new story in 1982 about White Wilderness and other animal documentaries. 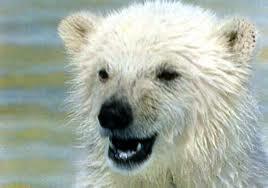 What came under attack was the use of footage that doesn’t actually take place in the Arctic. Journalist Bob McKeown reported that film makers used a studio in Calgary to recreate the Arctic landscape and shoot many shots there. A scene where a baby polar bear is sliding around on the ice is actually shot on the sound stage and the videographers pushed the bear around for added effect. The most disturbing findings brought up by The Fifth Estate are scenes about lemmings. Scenes supposedly shot in the Arctic following lemmings who will live life as a group and will march together no matter the cost were said to be faked in Calgary as well. Lemmings were shown to march across the landscape and jump into the Atlantic Ocean one after the other, only to hope that they make it to the other side before drowning. The scenes were actually shot on a platform at the Bow River in Calgary where videographers forced the lemmings to walk right off the platform into the river where all of them died. 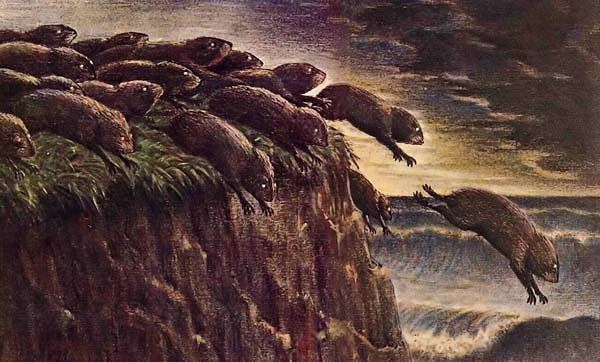 Experts were asked and McKeown found that the lemmings filmed were actually not migratory and would not have followed each other no matter the situation, especially in a death march as shown in the film. 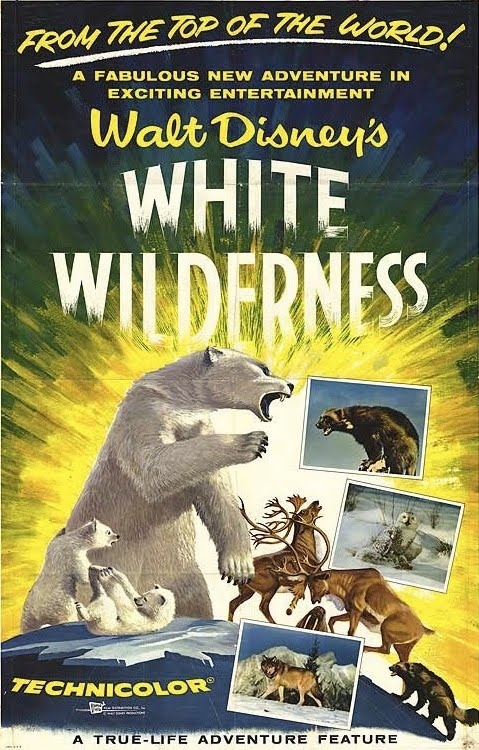 It’s unclear of Walt Disney or anyone at the Disney studios was aware of the footage they were editing being phony, but it does raise the question after knowing that White Wilderness was their second to last outing for the True Life Adventure series. It could have been that the studio was just running out of ideas for the series, but it could be somehow related to someone at the studio knowing and willingly adding fake footage to the film for dramatic effect. Regardless of anyone at the studio knowing or not, it’s an unfortunate incident tied to the Disney name. What are your thoughts on White Wilderness? Have you seen it? Did you know what you were actually watching when you saw the film or did you believe everything was shot in the Arctic? Leave your thoughts and let me know. What does Hawaii Five-O have in common with Davy Crockett? Only one connection! In 1958 there was a change at the Disney studio. After a good run of western films starring Fess Parker, including the cultural phenomenon of Davy Crockett, the studio was looking to take it’s live action films in a new direction. 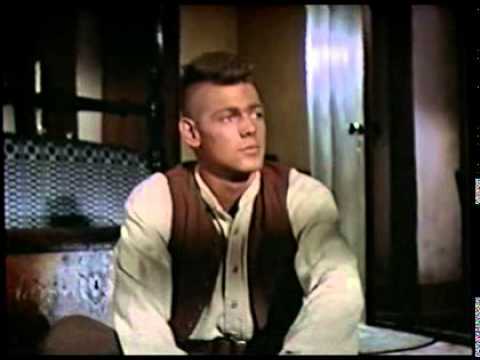 Like the previous film, Old Yeller, Disney looked to a popular book at the time for it’s last Western starring Parker along with a newcomer that would eventually star in Hawaii Five-O, James McArthur. 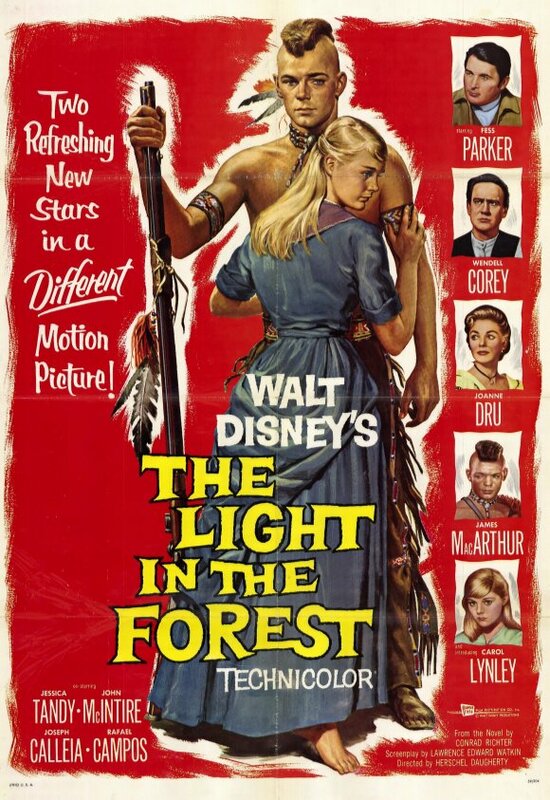 Written by Conrad Richter in 1953, The Light in the Forest brings a race war to the big screen in a much more serious tone than other fictional or historical films before it. The Light in the Forest is an interesting film built on showcasing a peace treaty between Delaware Indians who had white captives. The treaty would allow these captives to be set free and go back home but one boy, named True Son when part of the natives, reluctantly rejoins his white family as Johnny Butler. He falls in love with a girl and after seeing his two families, native and white, turn against each other, he and his love interest run off to land he was given and the war is never resolved. 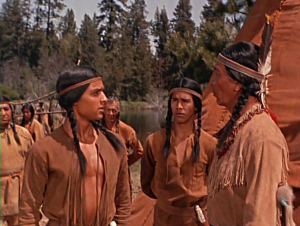 I can’t begin to explain the Native American-White American issues in this film and how they may resemble the African American-White American issues of the 1950s and how this film can be seen as a deeper look at that. I doubt Conrad Richter or Walt Disney had any idea that they were showcasing the race issues that plagued the “West” had glided over into the 20th century in a different way. Watching The Light in the Forest and seeing how negotiations between the Natives and the White Americans escalated into a war was eerie, knowing that the Civil Rights movement was on the verge of breaking through and that there would be many casualities in the movement toward equality. The film debuted on July 8th, 1958 and it won critics and audiences over. It was praised for it’s serious tone as well as it’s performances, especially by newcomer McArthur who would continue on to work with Disney in the future! It marks the end of another era at the Disney studios with a bang. There will be other ends by the end of the 1950s at the Disney studio. Despite it’s lack of popularity today, I suggest finding a way to see this film as the performances as well as the message and tone stack up against films of today, it just seems like it got lost somewhere in the shuffle of so many live action films in the 1950s. The mid-1950s were chalk full of western films from Disney, mostly starring Fess Parker who had made the role Davy Crockett the most famous character in television and film. The western film genre in general had been a big hit amongst audiences in the 1950s and as Walt was capitalizing on the rugged shoot-em-up genre, he looked at another semi-western in 1957. 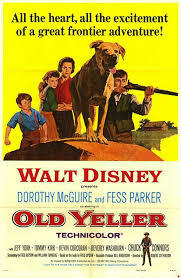 He wanted to make a film based on the best selling book by Fred Gipson titled Old Yeller. Old Yeller was a 1956 children’s novel that was a best seller and had won a Newbery award. It mixed Post-Civil War Texas life with a family story. It was the perfect blend of western and family film making that Disney was looking for. Disney brought Fred Gipson into to co-write the screenplay which allowed the film to be true to the novel, which was a risk for Disney as many of his films had been sugar-coated for audiences. The film also starred two of the Mickey Mouse Club cast members, Tommy Kirk and Kevin “Moochie” Corcoran, who had made a name for themselves as playing the Hardy Boys on the hit kids show. Fess Parker plays a small roll in the film as the boys father, but with so many of the past few films I have researched starring the actor, I’m glad to see that he only plays a small part and that the Mouseketeers get most of the glory here, at least as far as human characters are concerned. Old Yeller is a wonderful dog himself and steals the show as a stray dog who winds up being taken in by the family. Over the course of the film, we learn that the bond between children and dogs is endless and family is truly one of the most important things we have in life. As Old Yeller becomes a part of the Coates family, we connect with him as if he had always been a part of the family. When Old Yeller is infected from a wolf bite and has to be penned due to fear of him having rabies, we feel for this family being torn apart. Then, we get to the ending, when a rabies infected Old Yeller snarls at the boys. 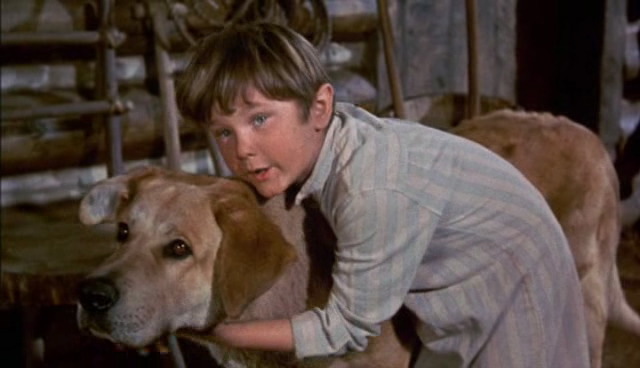 The older boy, Travis, played by Tommy Kirk, is forced to put down his dog that he had grown so attached to. It’s one of the saddest moments in film history. It’s strange to think that Walt Disney allowed for such a brutal ending, but he must have known that it would be for the best. The film was released on Christmas Day 1957 and was an instant hit with both critics and audiences. The film ended up grossing over $6M in it’s initial release and would go on to make over $21M in later releases altogether. It was within the top 5 films of the year. The film has gone on to be part of pop culture. It is referenced for it’s death scene on shows like Friends. It’s legacy far surpasses many of the live action films Disney had put out in the 1950s, and it may be one of the greatest live action films, the Walt Disney company has ever put out period!